One of my most memorable family vacations when I was a kid was our trip to visit relatives in Denver. It was the final landing place for my uncle who had traveled the world with IBM. I remember the stories my cousin used to tell me about living in Saudi Arabia, vacations in Africa, Sri Lanka and Japan as well as a variety of other places. They took full advantage of visiting parts of the world I’ve never even thought of. I was perfectly happy sitting around listening to their tales of adventure, but as was true to their lifestyle, they found things for us to do. They took us to see a restaurant that included indoor cliff divers as part of the ambiance. We toured the home of the Unsinkable Molly Brown where I first learned the ill-fated story of the Titanic. 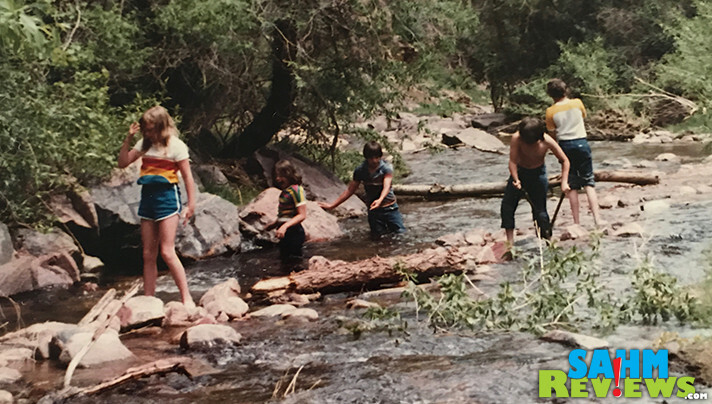 But the most exciting part was a visit to Rocky Mountain National Park, the Royal Gorge Bridge and went wading in a roadside stream while watching climbers on a nearby rock face. I spent a lot of time outdoors (in Iowa) as a kid so it was awe-inspiring to see all the beauty of nature in the mountains. In a pre-internet age, if you didn’t see it in the newspaper, magazine or encyclopedia or on network TV then you generally weren’t exposed to it… no matter what “it” was. That’s probably why the experience was so memorable. When the Michigan Department of Natural Resources asked if I would be interested in checking out What in the Wild game and sharing some thoughts or spreading the word, I thought of that trip to Rocky Mountain National Park and couldn’t help but say yes. 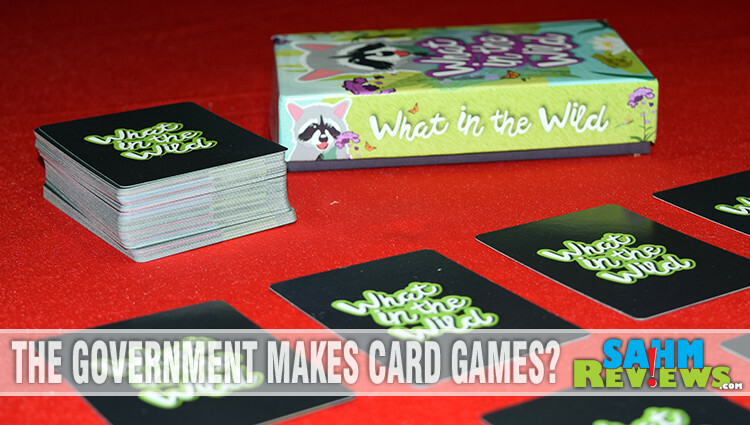 What in the Wild consists of a deck of 55 species cards and 65 resource cards which can be used to play five different card games: Match It!, Connect It!, Slap It!, Group It! and Build It! All the games are appropriate for players ages 8+ while some are good for kids as young as 5. They range in time from 2 minutes (yes, that’s a fast one!) to 40 minutes and accommodate anywhere from 2-7 people. In other words, there’s a little something for a variety of time frames or group sizes. The same cards are used for each game so it’s important to understand more about them. On the side bar of each card is the card’s name identifying either the plant or animal (species cards) or the type of space or habitat (resource cards). In the upper right corner you’ll see the card type, further identifying the food, water, space or shelter resources needed. 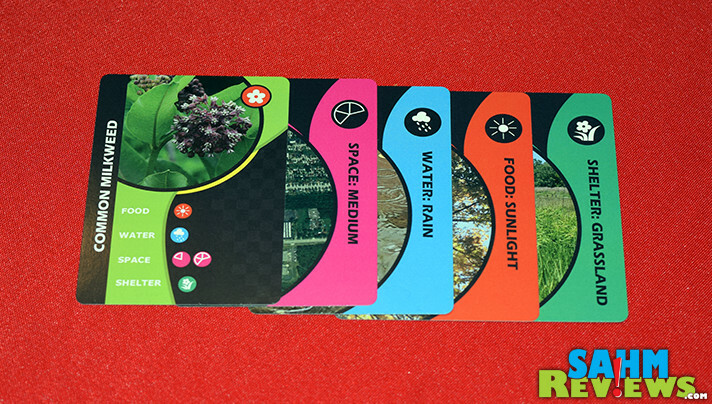 Finally, on the species cards, you’ll see a list of habitat needs. In and of themselves, the cards in What in the Wild game can be used as flashcards to teach about nature. 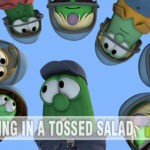 In Match It!, you’ve been tasked with running Puddle Ponds State Wildlife Area where your first duty is to learn where the resources are and if they are where the species need them. It’s basically a type of concentration. You’ll create a 6 x 6 grid of face down cards with the remainder creating a draw deck. You’ll flip two and if they match (or one is a resource for the other) then you collect them then replace the spots with cards from the draw pile and take another turn. If not, you flip them back over and end your turn. The game continues for 5 rounds of play and the player with the most cards wins. Get your bunny slippers on because in Slap It!, you are a member of the Bouncing Bunny Wildlife Club who will be helping species in Twisted River State Wildlife Area. One player acts as the biologist and the others as club members, each with their own set of goals. The biologist is kind of the moderator (card flipper) for the game while the club members are all racing to build habitats. One card at a time is revealed onto a discard stack. At any time, players claim the top card by slapping it – starting with a species card. You’ll be working to create a habitat including a minimum of at least 1 food, 1 water, 1 space and 1 shelter for that species. As you recall, the needs are listed on each species card so you’ll need to watch for those items then act fast to slap them. If you finish the requirement for one, you can work on another species. 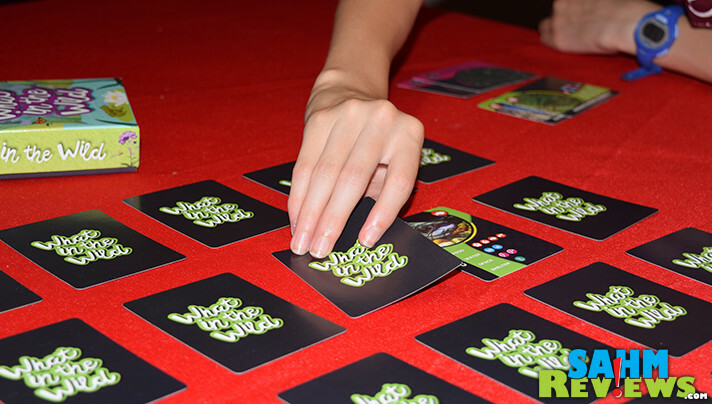 The game ends when the last card is flipped by the biologist and the player with the most completed habitats wins. We had a few problems with the instructions on this one as we were focusing gaining resource cards then realized some of the species cards are the only option for food for other species. We established a house rule that you could do that. The three remaining games involve more detail and thought, lasting up to 40 minutes. 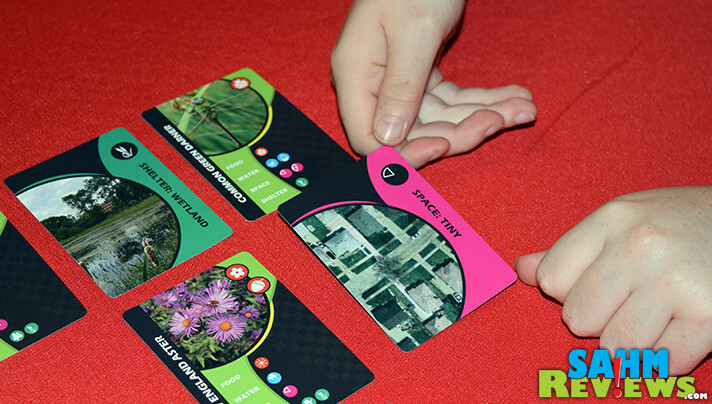 In Connect It!, you work as a team to use cards in your hand to create a cohesive habitat in the center of the table. Thematically, the boss has spilled coffee on your working papers so you’re trying to reassemble all your notes. Each player starts with 5 cards and one is placed face up in the center as the starting place. There’s a boss deck that contains 50 cards (your stack of notes) and your job is to get all the cards from your hands onto the grid before the boss stack runs out. Players take turns trying to add to the grid. Referencing the needs of the cards already placed, you may add a card next to it if it meets the resource requirements. 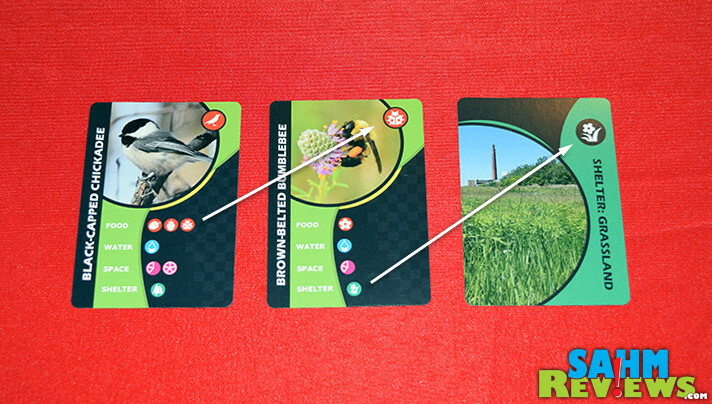 Species cards can go next to each other if they require the same habitat. We had some confusion regarding this since the example showed the shelter as matching, but we interpreted ‘habitat needs’ as all four (food, water, space and shelter). As with Slap It, we established some house rules for how we wanted to place other cards that meet the needs next to existing ones. Regardless how you look at it, the game requires some puzzle skills to be able to place all your cards. At the end of each round, five cards are drawn from the boss deck and must be added to the grid without the assistance of any cards in players’ hands. For each card you cannot place, each player draws two cards from the boss deck. You can see how careful you have to be to not run out of the cards in the boss deck. The game requires cooperation, communication and analysis to assemble the puzzle pieces. While What in the Wild doesn’t have the same depth as many of the hobby games we currently play, it does have a lot of benefits. 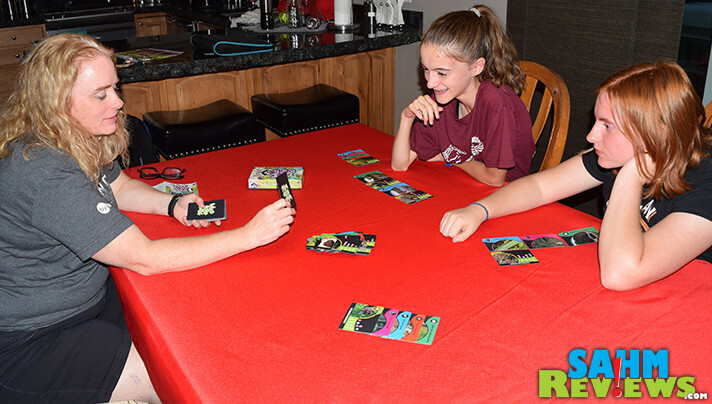 One deck plays 5 games and does double duty as educational and entertaining. It teaches a lot about the various species so players have a better understanding of the needs in nature – and of the food chain. Coyotes eat squirrels, squirrels eat plants, plants “eat” sunshine. These games embrace nature and the importance of it. That’s what we should naturally expect from the Department of Natural Resources, right? 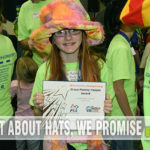 Whether you’re looking for an educational game for your kids (or yourself), enjoy visiting local, state or national parks, want to learn more about the world around us or simply want to play a fun family game, What in the Wild is worth reading more about. 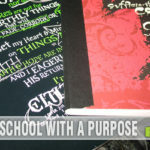 Visit the Michigan DNR website to learn more about their Wildlife Classroom Curricula and when (and how) you’ll be able to purchase What in the Wild. And if you feel like chatting about nature, engage with them on their Michigan DNR and Michigan DNR Wildlife Twitter handles or on Facebook where they’re regularly sharing about all kinds of nature and wildlife! When was the last time you visited a state or national park? I love that you can play multiple games with this one set of educational cards! Where to purchase cards and cost?? ?